2007 stallion grading Havanna was the only pony that was successful at the grading. Havanna is owned by Debbie Maas and was bred by Lorna Shaw, Lundin Links, Fife, a regular and successful breeder, producer and competitor in the breed ring. In 2006 two filly foals were born at the stud out of their star mares Sharodon Murron (who won champion sports pony at the Scottish sports horse shows on 3 actions) Scholland Folly (gained the highest free jumping marks at the 2005 mare and young stock grading) both fillies going on to gain first premiums in 2006 grading following their fathers and mothers footsteps who also gained a first premium as a foal. 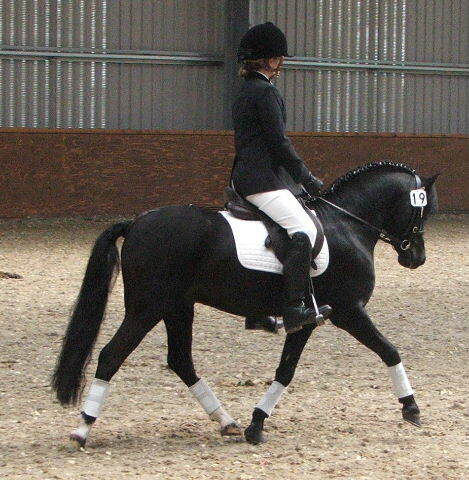 He knows competing British dressage and is placed every time. He qualified for the Scottish Dengie novice (pony club) with a score of over 75% .In 2008 he will be starting BSJA jumping as well as continuing British Dressage. This year he has 1 filly out of Sharodon Murron (sire penwisg hellfydd dam penwisg merwen) herself been a successful sports pony mare) who gained a 2nd premium.